For as much as I like to stress five on five play, special teams are just as important. Thursday night was a great example as four of the total goals were on the powerplay. The second goal for the Capitals was a bit lucky, but as the old saying goes, you have to be good to be lucky. 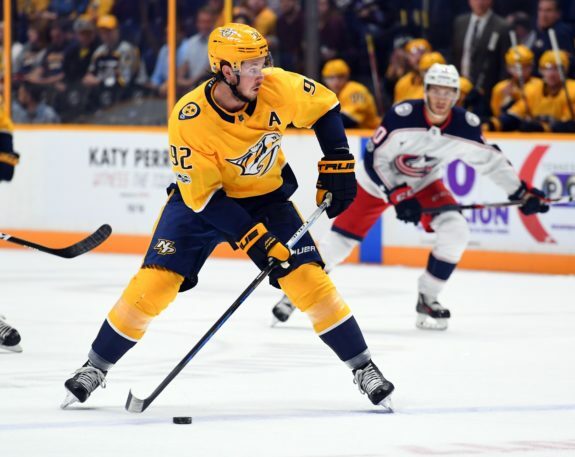 The Nashville Predators looked tired as they finished up their road trip, although there were ample opportunities for them to take control. It wasn’t all bad though, as each team took turns owning possession. One of the biggest positives was that Pekka Rinne and Eeli Tolvanen got some much-needed rest, but otherwise, it was a pretty mixed bag. I love bottom pairing/line guys, and I think they deserve their minute in the sun. Matt Irwin is one of those guys, and while I have some major issues with him being on a playoff roster, he was good on Thursday. Although, there is a reason for that. Before we get into it, let’s look at the chart. 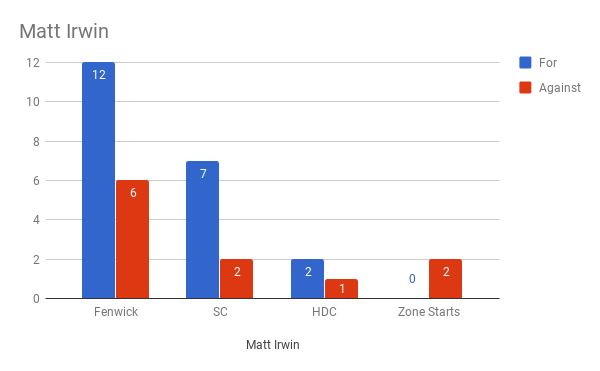 For reference, I’m using unblocked shot attempts (Fenwick), scoring chances (SC), high danger chances (HDC), and zone starts for (offensive) and against (defensive). All stats are at five on five. The stats paint a pretty picture. Irwin was on the ice for more good things rather than bad, to put it simply. The lack of high danger chances allowed is wonderful and Irwin was actually a positive. He was solid around the net and decent in transition, although was caught a little flat-footed by some of the quicker Capitals. A lot of these pretty looking stats are artificial though. Irwin only played about nine minutes and never faced top competition. Instead, he went against guys like Davante Smith-Pelly and Lars Eller, known third-liners. Good on Irwin though, as he made the most of his mismatch. Games can vary period by period, and I honestly thought the Predators were going to lose by the end of the second. Then came the third period and the Predators squeaked out a hard-fought victory. The third period was nothing short of spectacular from the Predators and they earned it. Let’s go back to the stats, everything is at five on five once again. 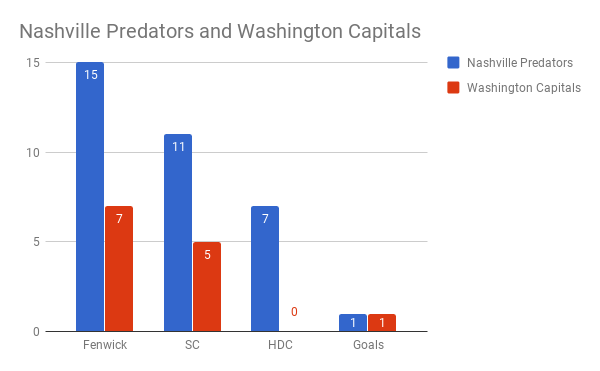 It’s beautiful, and the Predators actually beat out the Capitals in goals with two, instead of one. All in all, the Predators were twice as good in the third period, and they were rewarded because of it. The Fenwick and scoring chances are great, but the high danger chances are the crown jewel. They produced seven high danger chances alone, that’s more than half of what they created all game. The Capitals couldn’t protect their slot to save their lives, or more importantly, Phillip Grubauer’s life. The best example was Ryan Johansen’s goal, as he tipped/shot from a high danger area. If only the Predators could play every game like this period. 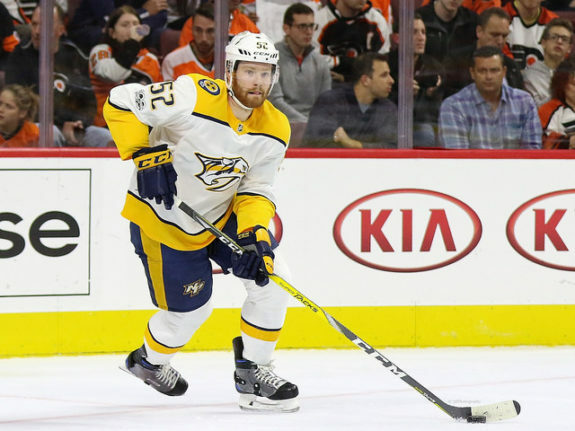 Craig Smith is probably the streakiest scorer on the Predators, but he was red-hot on Thursday. He scored two goals and was everywhere in the offensive zone. The defensive zone was a different story, but that’s not where he makes his money. Besides those two goals, Smith created three high danger chances and five shots. If he can keep up his play, there could even be a Conn Smythe in his future, although it’ll probably go to Pekka Rinne. If it happens. The Predators come home for their final game of the season. 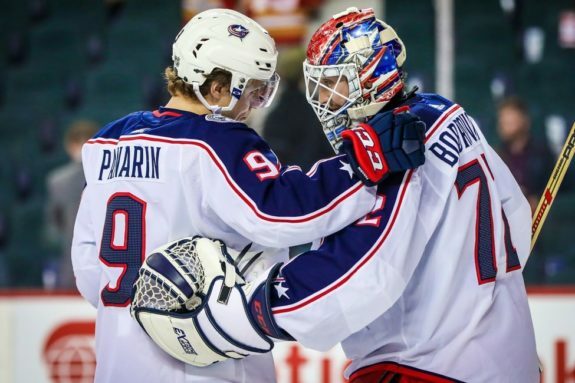 The Columbus Blue Jackets are fighting for the third spot in the Metro Division against the New Jersey Devils and Philadelphia Flyers, both of whom are within one point in the standings. All of them also have the same games played, as of Thursday night. This game will mean next to nothing for the Predators, but could mean a good playoff spot to the Blue Jackets.